What’s more, there were actual sales to be had, even in the opening hours, especially impressive given the fact that Old Master collectors are usually more likely to linger over potential purchases, rather than impulse-buy an ancient Greek bust, many dealers said. Sure, maybe exhibitors weren’t selling out their booths, but the feeling conveyed by each one was that a new iteration of TEFAF could offer something different in an overcrowded fair season, and the high turnout on a rainy Friday was just one of the reasons it appears this very European fair will work in New York City. Anderson Cooper, for instance, took some time off from covering this increasingly out-of-control presidential election to swing by the Armory on his lunch break and purchase a work at the Otto Naumann Ltd. booth: Anton Raphael Mengs’s Portrait of Mariana de Silva y Sarmiento, Duquesa de Huescar, for $275,000. “My partner collects Old Masters—I collect more contemporary, but at a certain point, you can collect both,” Cooper said, while standing in front of the Mengs, which many at the fair recognized from its prominent inclusion in the Met Breur’s inaugural show, “Unfinished: Thoughts Left Visible”—the Duquesa’s face is blank, smeared off, giving the work a chilling postmodern feel. 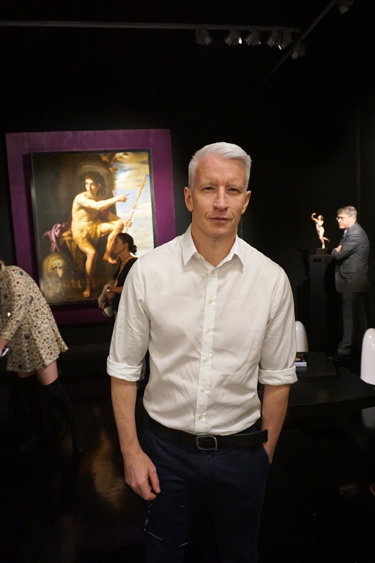 When asked how he had time to come down from the CNN offices in the Time Warner Center, drop a few hundred grand on a painting, and then head back to work to film Anderson Cooper: 360 during the run-up to this election, he looked at his watch. Please click on above link for complete, original article. UP CONSPIRACY THEORY FROM A MAN WHO IS 70 AND HAS THE MENTALITY OF A SEVEN YEAR OLD. HILLARY WOULD SAY HE HAS THE TEMPERAMENT OF A SEVEN YEAR OLD. ON ANOTHER NOTE, LAST NIGHT, ANDERSON FINALLY TOLD OFF SCOTTIE NELLY HUGHES WHEN SHE SAID SHE DOESN'T BELIEVE THE POLLS BECAUSE "YOU DON'T SEE IT AT THE RALLIES, WHICH ARE LARGER THAN EVER." ANDERSON USED HIS SMIRK, AND SAID "THAT THERE ARE THEORIES THAT 9/11 WAS AN INSIDE JOB. THAT DOESN'T MAKE IT TRUE." EVERYONE ON THE PANEL LAUGHED AT HER AND SHE DESERVED IT. A few months back ATA showed another picture Anderson bought. I recall that one was sort of a mishmash portrait and was rather creepy. This newest one has no face and is also a bit creepy. Nonetheless Anderson can buy - and afford to buy - any picture he likes and hang them up in his house. My opinion does not matter, one's taste in art is very personal. And it's not like I'll be invited to dinner at Anderson's place and try to eat while faced with such creepy pictures. Speaking of personal tastes in art, my dining room has a Monet reproduction print; the water lilies one. That may be way more ordinary than Anderson's pictures but I like Monet and no one will ever get indigestion looking at it.